I’ve got Merlin Yoxall jacket and Hulme pants on the way. Anyone with some experience with waxed cotton gear? Mother Nature did it best. I’m intrigued to see how you like it. It certainly is better looking (although in the same vein) as a belstaff, with some more modern appointments,it looks. Yes, I lived in waxed cotton gear 'way back in the '60s. Belstaff or Barbour from England, had many expanding pockets, buckles, snaps, belted ... jacket and pants, totally waterproof and you could repair and re-wax them. I'd melt the wax and brush it on, then stick the jacket in the oven to get it soaked in. On warmer days in the sun, the wax would soften ... and smell, but once you had a good layer of dirt going on, the fabric would take on a bit of a gloss. Last edited by whynot; 01-19-19 at 12:45 PM. I like the waxed cotton for bad weather; I use it for raingear and strong cold (below 40F [5C]). It's tough enough to last well and hold up, but I don't count on it for crash protection; I wear my leather jacket under the Belstaff duster. That's a little cumbersome, but if I'm wearing the Belstaffs, it's usually wet and/or cold enough that I want the extra layers anyway. Last edited by PhilB; 01-19-19 at 11:14 AM. I’m not planning on leather underneath, but I tend to fall between L and XL and prefer roomier so I went XL. If this kit keeps me comfortable and not feeling overstuffed when temps are 35f and above, it’be a win. I have a bunch of Barbour stuff. Works a treat. There is upkeep however. They can be sent back and recoated or you can try to do it yourself. Everything tends to wear rapidly on edges and corners. I do like it though. Jacket should arrive tomorrow, pants on the 28th. Last edited by nt650hawk; 01-23-19 at 10:23 AM. I picked it up on a whim and used it in Sturgis a couple years back. It was a great jacket for the abrupt changeable weather. The hot-cold, sun-rain weather that changed every few hours. It is just like a modern shell jacket. You need to use it with layers so it can pull multiple duty. 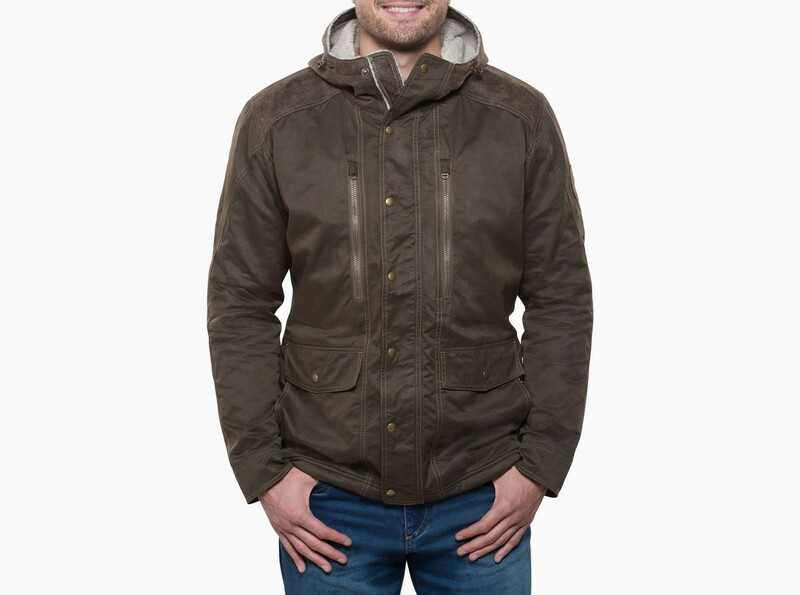 The jacket was light, had more performance than expected, and was comfortable in a range of conditions that did include getting caught in the rain. It somehow kept me warm on cold mornings, yet not overheat as the day warmed up. It really impressed me. It's no GoreTex but it's not far from it. It's 100% about style. Let's face it. There are modern materials that have replaced this stuff. BUT if you are riding a retro bike you might as well go for the retro clothing. It does add to that same experience. Seriously that jacket now has dust from Sturgis stuck to its wax and it collects memories much like a bike you ride. I can see why moto writer Peter Egan mentioned his wax cotton so often in his articles in Cycle World. One thing to know about wax cotton garments. They smell oily. You have to leave them in the garage. This jacket never has that smell disappear. The warmer the jacket the more it wreaks. When the jacket is cold it does stiffen up and feels like it is frozen. If you ride a vintage bike you have a lot of options now for vintage gear. The stuff lasts forever with re-treatment of wax. The bike's not vintage, except in style (Honda CB1100EX). The rider is definitely vintage. That is a sharp looking jacket. does Kuhl spec it for general wear, or is it skiing, hiking appropriate? This stuff works great in the cold, took the CB1100 out today, local temp about 36. I have a vanson waxed cotton jacket. I love the look and feel of it, plus in really blocks ALL wind. So even though it's not insulated, it's a great chilly weather jacket.